Last modified on August 21st, 2018 by Vincy. Seamless UI / UX is a must for your application to standout in this noisy web world. Every day we are seeing revolutionary changes with innovations in web design. One such UI that has changed pagination forever is the infinite page scroll. The Facebook uses it in its wall which is the primary UI for the users. The infinite scroll replaces the traditional pagination design with page numbers and navigation links. Displaying paginated results with the usual navigation link is almost outdated. 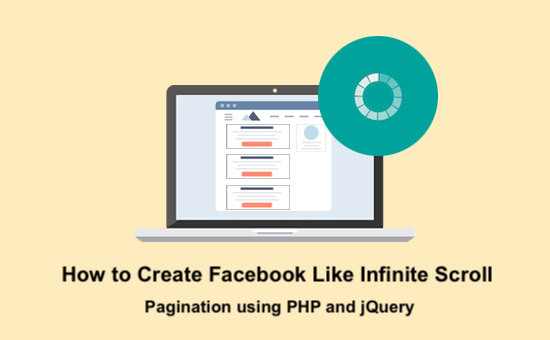 Let us see about how to implement the infinite scroll pagination like Facebook using PHP and jQuery. In a previous tutorial, we have seen a an example of creating pagination using PHP with AJAX. We have also seen pagination example without AJAX on how to load dynamic data on the page scroll. With the reference of those codes, we can implement the Facebook like content loading with infinite page scroll. 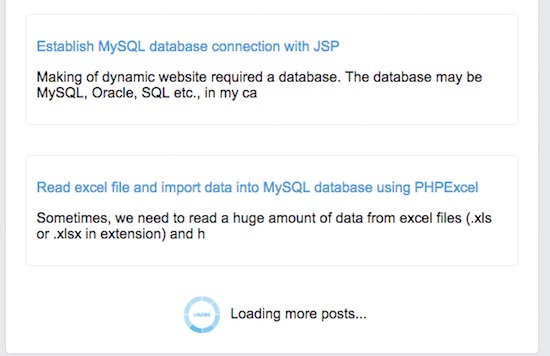 I have used PHP, MySQL with jQuery in this example for this type of dynamic content loading. On the page scroll event, the AJAX request is sent to access PHP by sending the page offset. In the PHP file, the page offset and other params are received by using the appropriate request methods. These params and the perpage constant are used for calculating the query limit to retrieve the data to be loaded dynamically. If you are looking for PHP CRUD with search and pagination using AJAX refer the linked article. This HTML code loads jQuery to execute the AJAX script to fetch the database result without page refresh. In this HTML, there is a container to load dynamically that are retrieved via AJAX request. Initially, it loads the first block of data from the database. And then, the subsequent AJAX request will get the content to be appended to the bottom of the existing content. The AJAX script is added inside the $(window) scroll event handler. This script will be executed once the user scrolls down and touches the bottom of the page. On each scroll, the page offset is updated and preserved in a hidden field. This offset will be sent with the AJAX request while accessing PHP to get database result. On successful AJAX response, data is received and appended to the existing page content. While processing the AJAX request, a loader image is shown to intimate the user that the content is getting loaded. This PHP code establishes the database connection at the beginning of the program. It receives the AJAX params and calculates the query limit with the page offset and the per page limit. By using the calculated query limit the results are fetched from the database and returned as the AJAX response. This SQL script is used to create the database table and insert the data to be read and load dynamically on the page scroll event. Below screenshot shows the dynamically loaded content. The loader icon in the picture will be displayed while requesting PHP for the dynamic content. Once the content is appended, the loading message will be hidden.